Izaak Walton, in his classic work entitled ‘The Compleat Angler’ published in 1653, wrote the following about the trout’s favourite prey: “… and he especially loves the May-flie,” Many years later, Dave Whitlock (see ‘Guide to Aquatic Trout Foods’) unequivocally reaffirms the status of the mayfly by remarking that “Mayflies are the best known and most popular of all trout foods”. 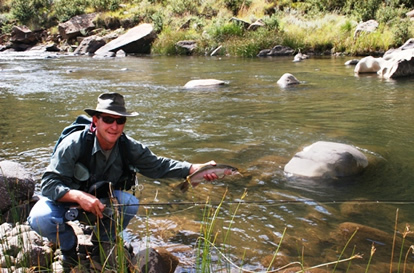 Gary Borger, in his mammoth work entitled “Presentation”, also describes mayflies as “…the insect group upon which modern fly fishing was founded.” Stomach pumping exercises, performed on trout caught inhabiting the rivers and streams of the North Eastern Cape, lend further credence to the astute observations of Walton, Whitlock and Borger. More specifically, the results of stomach content analyses, performed over more than 10 years by the authors, reveal that mayflies constitute, on average, in excess of 75% of the food forms found. The Latin name for the mayfly order is Ephemeroptera and describes two things synonymous with the mayfly: the adult stage in the mayfly’s life cycle is short-lived (usually between one and two days in duration) and the adult is a winged insect. 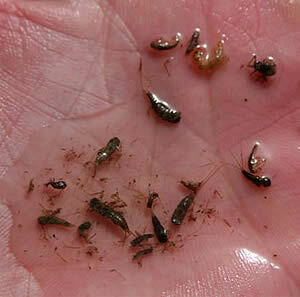 There are nine families of mayfly found in rivers and streams in South Africa. These include the Baetidae, Caenidae, Heptageniidae, Leptophlebiidae, Oligoneuridae, Teloganodidae, Tricorythidae, Polymitarcyidae, and Prosopistomatidae families. Of the abovementioned families, only the first seven are of importance to trout, and hence, the fly fisherman. 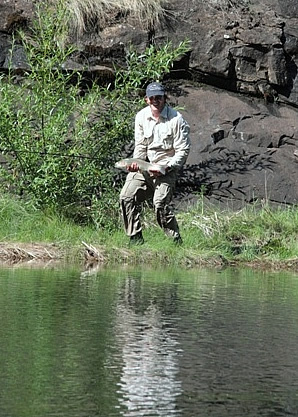 The last two families, due to their behaviour and habitat choice, are seldom, if ever, targeted by trout during their nymphal phase of development. This article presents a short overview of the Leptophlebiidae family’s life cycle, the Leptophlebiidae nymph anatomy, the Leptophlebiidae sub-adult (dun) anatomy and descriptions of the materials required and tying procedures for impressionistic, South Africa-specific, Leptophlebiidae nymph and sub-adult imitations. The Leptophlebiidae mayfly family is also sometimes collectively referred to as “prongills” and there are twenty known species in South Africa. The most famous species of this family mentioned in international literature include the claret dun, the black quill and the slate-wing mahogany dun. from a scientific perspective (i.e. there is no pupal stage between the larva and adult stages). The life cycle consists of four distinct stages, namely the egg stage, the nymph stage, the sub-adult stage, and the adult stage. 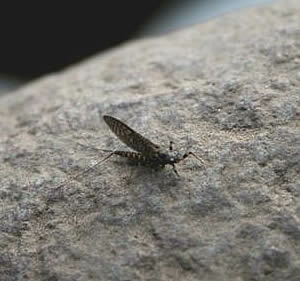 The two adult stages are unique to the mayfly – during the sub-adult or sub-imago stage the mayfly is sexually immature. 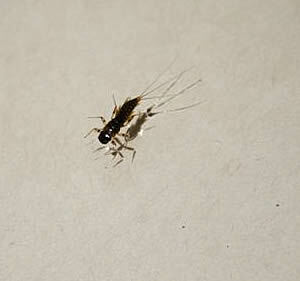 The life cycle of the Leptophlebiidae mayfly starts when the sexually mature adults (i.e. 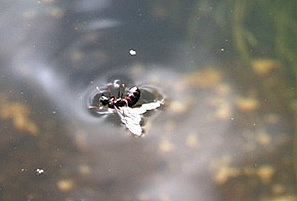 sub-adults or sub-imagoes or spinners) mate during flight, after which the males die and fall to the water’s surface or onto surrounding land. The female of this family lays her eggs by dipping the end of her abdomen into the water’s surface, whilst flying low over the river or stream. The eggs sink, and due to current movement, are scattered along the substrate and between debris and aquatic vegetation. 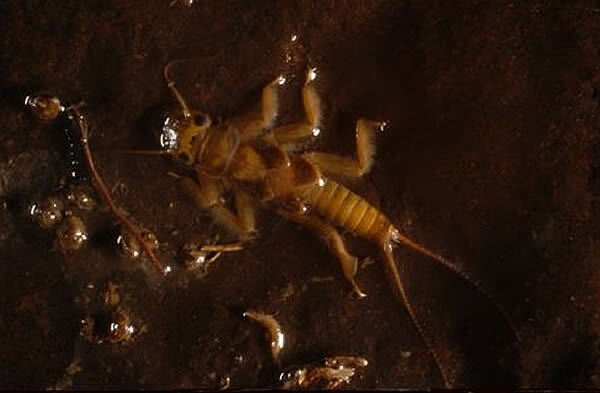 Upon hatching, the Leptophlebiidae nymphs live on the river bottom in slow moving or still water areas, sheltering from predators and currents by hiding under stones and debris – these nymphs are also protected by their camouflage. The nymphs are capable of running across the substrate and swimming for short distances only. 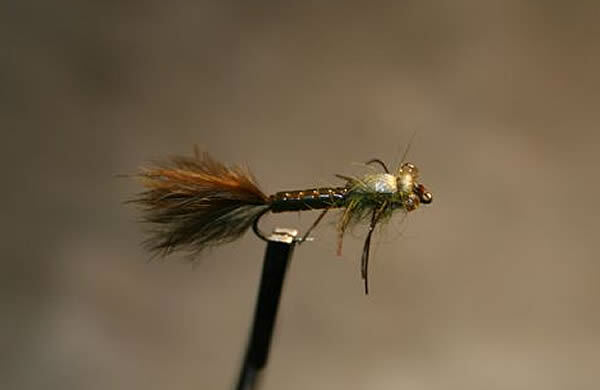 In British fly fishing circles these nymphs are referred to as ‘laboured swimmers’. The nymphs feed on aquatic vegetation by removing algae and detritus from the undersides of stones and rubble. An abdomen – the abdomen consists of ten clearly defined segments, of which four to seven have gills attached, and three, long, well defined, spreading tails are found on the final segment (the tails are longer than their bodies). 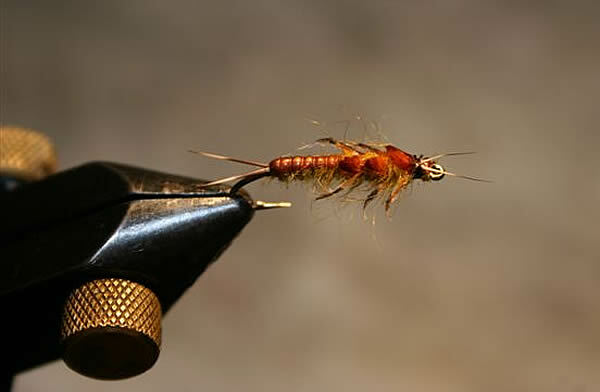 The tails of the Leptophlebiidae nymph are generally much longer compared to most other mayfly families found in South African rivers and streams – only the Heptageniidae family could possibly rival it in terms of tail length. The surface areas of the gills of the Leptophlebiidae family are large, since this nymph occupies the slow-moving or still water areas of rivers and streams, and as such, it must produce current in order to take in enough oxygen. Each gill is split into two lobes and is either hair-like or leaf-like in appearance or a combination of both, depending on the specific species. The body colour of the nymph ranges from brown to dark brown. A reddish-brown body colouration is also occasionally found. From a fly fishing perspective, the nymphal phase of the Leptophlebiidae family’s development is the most important stage to imitate. 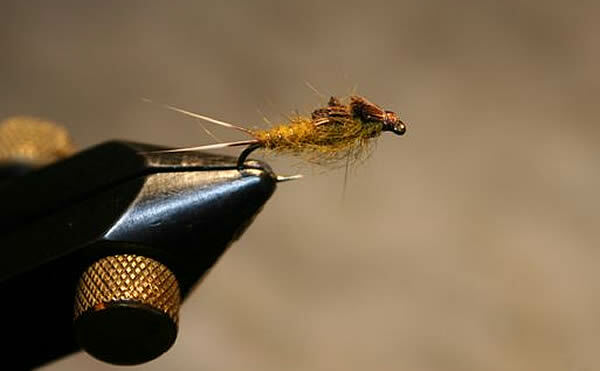 Since the nymphs of this family are generally quite large, trout love to target them, especially when they loose their footing and are washed away by faster currents. 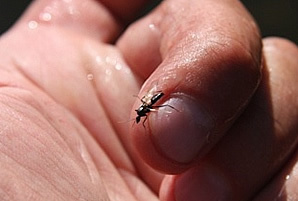 Regular seine netting performed in the rivers and streams in and around the village of Rhodes has revealed a preponderance of these nymphs right throughout the year. 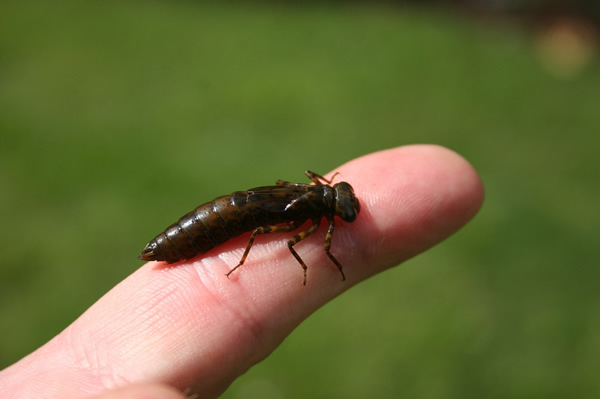 Once the Leptophlebiidae nymph has fully matured, in terms of growth and age, it will either crawl out of the water onto a rock or tree trunk/branch, or it will ascend to the water’s surface in still water areas, where it will force its way out of its nymphal skin and unfold into an air-breathing, winged sub-adult, called a dun. In the North Eastern Cape Province of South Africa, the most prolific hatches of the Leptophlebiidae family occur in the late season (April/May) and early season (September/October). The dun sits almost motionless on the tree trunk/branch, rock or water’s surface until its wings and skin have hardened and dried sufficiently, after which it flies to waterside vegetation. Here it transforms into the final life cycle stage, namely the sexually mature adult (imago or spinner). 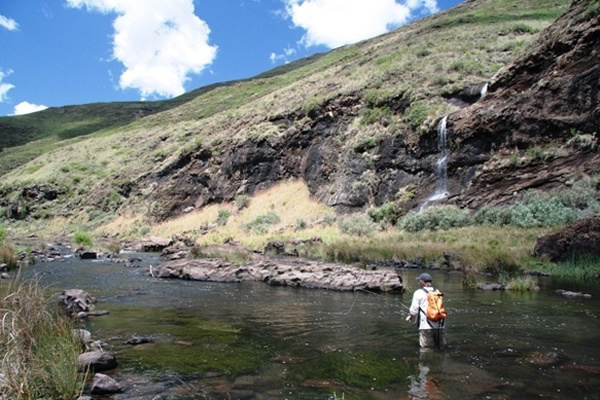 Although North Eastern Cape trout prefer the nymph imitation, they will prey on the dun. The spinners, on the other hand, are not of any significance – the authors have never witnessed a fall of Leptophlebiidae spinners on the rivers and streams of the North Eastern Cape. In the United States of America the spinner of this family is generally also considered to be of little importance. The body design of the Leptophlebiidae dun closely mimics that of the nymph. The obvious differences include, the absence of gill filaments (these are replaced by a “tracheal tube diffusion network” – see Whitlock) and the presence of two pairs of upright, sail like wings (the forewings are noticeably larger than the hind wings). The duns are not very colourful and have a very drab look. They generally average between 7 and 12 mm in size and have medium to dark brown bodies (only the spinners have reddish-brown bodies), slate grey wings (sometimes heavily mottled), three brown tails and six, well defined brown legs. Bead: Optional, 2,3 – 2,6 mm gold bead on # 14 hook and 2,6 – 3mm on # 12 hook. Weight: Optional but advisable, depending on the strength of the current. Tail: 3 – 6 Squirrel tail, water mongoose or similar dark brown or black fibres the length of the hook shank or longer. This imitation should be fished in the cushioned boundary layer just above the stream bottom, as deep as possible. It is not that the nymph necessarily drifts this deep but fish that avoid currents and lie within the cushioned boundary layer would rather accept a food source that drifts within range so that they do not exert too much energy reaching it. The Zak may be tied with a couple of turns of crystal flash and with a gold bead (that acts as a trigger and a weight) as in the photos, for fast flowing streams but in clear low waters it is advisable to use less flash and at times even exclude the bead. 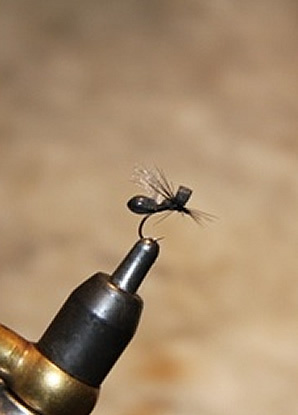 When targeting fish in slow or no current areas a Leisenring Lift or even the occasional hump mend would lift the fly off the bottom and imitate a fleeing nymph triggering a reaction. When the Leisenring lift is executed it helps to wiggle the rod tip to create an erratic swimming action. When fishing these imitations in fast currents, drag free, it is necessary to fish up or up and across using a strike indicator for depth control and strike detection. 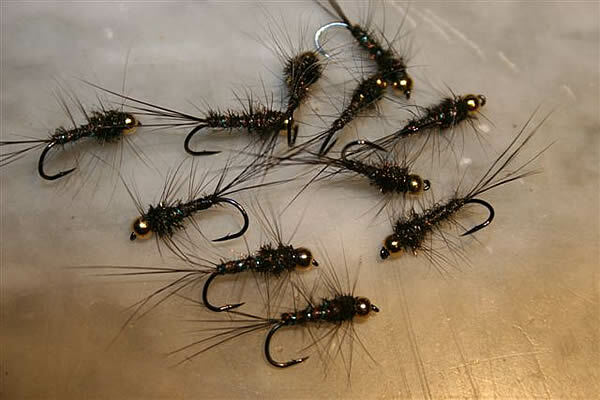 Fish often sample imitations in strong currents and spit the fly after realizing that it is not the real thing, the indicator will warn the angler to strike as soon as possible to set the hook. When fishing in slow or no current areas and using a Leisenring Lift, it is often not necessary to use an indicator as the take will be felt and the drag of the indicator on the water surface may alert fish. 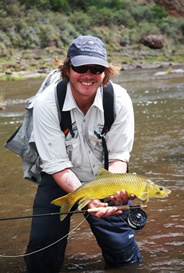 For maximum results, use a long tapered leader with 5X tippet (double figure fish are often landed on 5x tippet) and insure that drag does not have an effect on the fly. 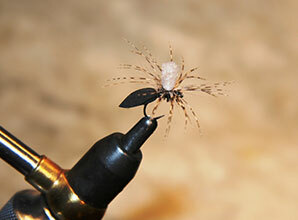 Hook: # 14 or 12 thin wire dry fly hook. 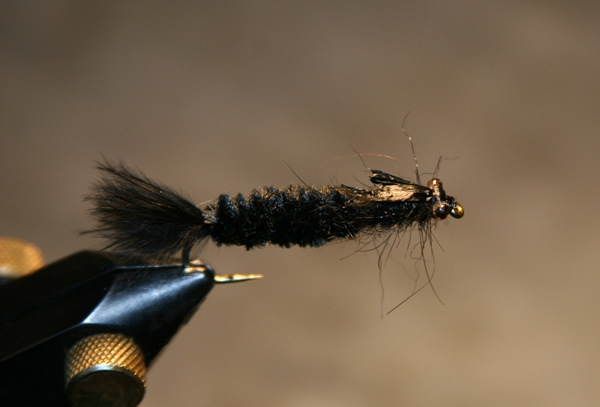 Tail: Brown or black deer hair or water mongoose fibres. 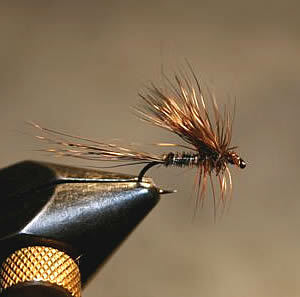 Legs (hackle): Dark Brown or red-brown hackle, cut level so that the fly sits with its body on the water surface. This imitation should be fished with a drag free drift in the slow or fast moving current areas with a long leader and 5X tippet.